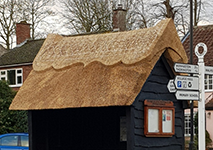 I started thatching as an apprentice in the Waveney Valley 15 years ago and began my business in 2001. In 2007, I gained the prestigious Master Thatcher title – awarded by East Anglia Master Thatchers Association (EAMTA) following assessment of my work. Although predominantly a Suffolk thatcher, I am also available for work throughout Norfolk and Essex, and for large projects in other parts of the UK. 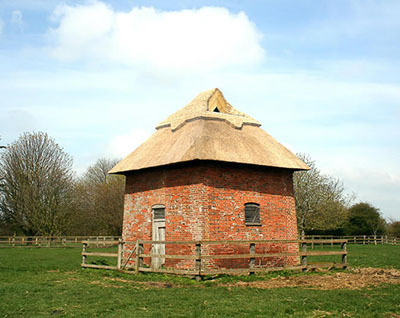 I work mainly with water reed (also known as Norfolk reed) and long straw, the area's traditional thatching materials. As much as possible, I source reed from the Norfolk Broads – and to ensure a constant supply of quality straw I grow it myself using traditional methods. For free advice or a quotation please contact me: full details below. ... We were extremely pleased with the finished outcome, and wouldn’t hesitate to recommend his work. ...Everything was cleared away on 16th October 2012 and there was this beautiful reed thatch with a netted, patterned straw ridge - the pattern unique to my roof. It was an amazing experience to share with others - it was, and still is, the subject of admiration - a tribute to Dominic. ... Dominic is an influential member of the ‘Master Thatcher’s for our region and comes with many recommendations from villagers in our area.